Based on the requirements of our clients, we adjust our efforts in order to meet business, strategic and cultural challenges. Executive development is a tool for realising the strategic ambitions of a company. Together with control systems, management is the link between ambition and action, dream and reality. Therefore, all executive development must be rooted in a company’s senior management if it is to have any effect. That is why our contact in a company is the CEO in the case of small and medium-sized businesses or a member of the group or division management in large concerns. Working with the company’s senior management, we customise executive development to meet the strategic needs of the business. The challenge facing an executive lies in making good strategic decisions and then putting them into practice using systems, processes and motivated employees. Executive development is therefore about strategy, systems, processes and interhuman relations. Strategica provides executive development in cooperation with Stockholm School of Economics IFL Executive Education. Stockholm School of Economics is Scandinavia’s leading provider of bespoke executive development (as ranked by the Financial Times). 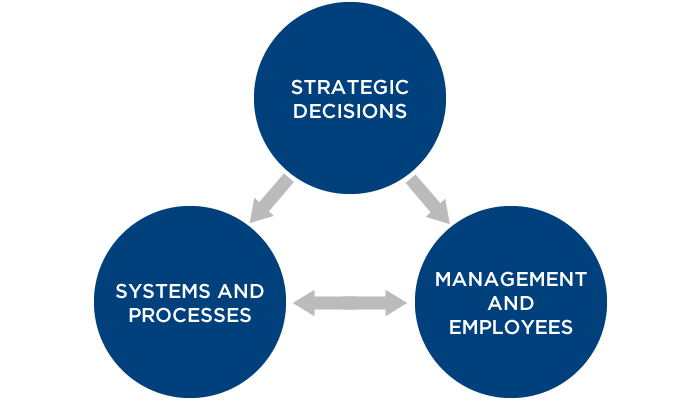 Programmes focusing on the interdependence of strategic decisions, financial and commercial understanding, systems, processes and the role played by the individual’s manager and employees are run under the direction of the Stockholm School of Economics. Programmes that focus more on developing culture and personal leadership in the form of handling interhuman relations are run under the direction of Strategica AS. Our programmes have centred on the following subjects: internationalisation, comprehensive business understanding (strategy, financial planning and control, marketing, etc. ), relationship management, cultural development, executive talent development, technological development, commercialising innovations, etc. In our opinion, an executive development programme should be a total experience. This means that we can take responsibility for everything from the moment participants get up in the morning until they go to bed. Good lecturers, educational tools that are both innovative and realistic, and highly specialised content can be taken for granted. We also take care of the social programme and an element that we call “Mind Expansion” – experiences that include everything from visiting foreign families for dinner, meeting monks in a Buddhist monastery and firewalking to opera and theatre, etc. All put in a context that is of relevance to the programme. As the programme organiser, we are present throughout the programme and take care of the learning environment, ensuring that participants pick up the connecting thread running through the programmes. Executive development provided by Strategica is never mediocre. We aim to deliver programmes to the top echelon in international competition.